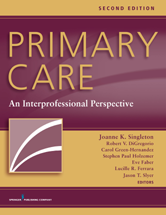 This second edition of Primary Care delivers succinct, current, and integrated information on the assessment, differential diagnosis, treatment, and management of individuals with commonly seen conditions in primary care settings. Written and edited by APNs, MDs, PAs, PharmDs and other health professionals, it emphasizes guidance on differential diagnosis, interprofessional primary care, lifestyle management, health promotion, risk reduction, and disease prevention. The text features relationship-centered care, extensive coverage of age, gender, and occupational considerations; complementary approaches; nutritional assessment; violence exposure and vulnerability assessment; family, community, and cultural assessment; palliative care; and evidence-based practice guidelines. Coronary Artery Disease - Joseph J. DeRose, Sr., Joseph J. DeRose, Jr.